Ever since they debuted in 2010 iPads have had a powerful impact on hospitals and healthcare. Physicians can easily explain things to patients with its vibrant images, access results and patient records with the flick of a finger, or even use special apps to help them treat patients. They make the lives of physicians a lot easier and more efficient. However, while the iPads many benefits to medical professionals may be great, its their influence on patients that makes iPad implementation on hospital wireless networks truely worthwhile. 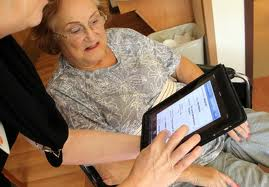 Here are 2 great way iPads on hospital wireless networks can change the lives of your patients. Imagine being able to speak almost all your life, and all of the sudden this natural ability to communicate your wants and needs has been stolen from you. Unfortunately, that’s exactly what many stroke patients are left to deal with after surviving a stroke. iPads can give these patients back a means of communication and even help teach them to speak again. There are apps specifically designed to help patients communicate simple needs like “I want a drink of water” or “I need to go to the bathroom” by touching that button their need is said aloud so they can relay the message to medical personnel and actually hear the words aloud to begin training their brain to learn the pronunciations again. Hospitals like Florida Hospital Memorial Medical Center Oceanside have been using iPads on their hospital wireless networks to help aid aphasic stroke patients across the country. With 1 in 8 children being diagnosed with Autism, it is particularly important to point out how many children can be affected when hospital therapy programs bring iPads into therapy sessions. Autistic children in therapy centers across the country are being introduced to iPads and parents are calling it a breakthrough. iPads can be used to give some autistic children the ability to communicate by touching pictures the same way it can be used for stroke patients. Through colorful interactive apps and lessons, autistic children can learn how to communicate and socialize with others easier and more effectively than ever before. Hospitals can customize and download apps to enhance each child’s treatment. So iPads may be just what the doctor orders now. As the iPad becomes increasingly popular and more apps are being centered on healthcare, we can expect to see many hospitals utilizing the iPad in creative and educational ways to enhance patient care and maybe even change lives. When integrating this device into your hospital wireless network security and privacy are key. Here at SecurEdge, we are experts in healthcare wireless networks, so we understand new mobile devices can create new challenges for IT departments ranging from new sets of securities, configurations and management. At SecurEdge Networks we always plan for the future of wireless technology. If you need help preparing your hospital wireless network for the future, download our Free Hospital Wireless Network Design kit or contact us for a FREE consultation.